I know I am posting this late because Chhori is already a month now. Nwaran was performed when she was 11 days old. 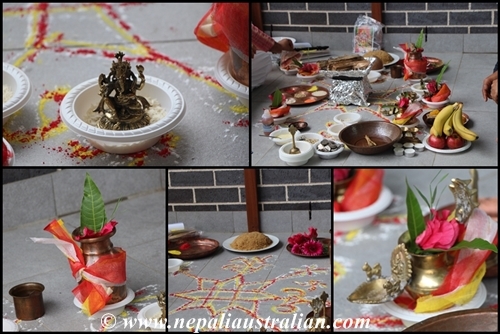 Nwaran ceremony is also known as Machabu Byakegu in Newari. 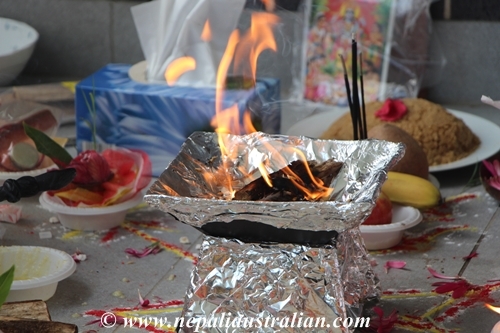 This ceremony is performed to give a birth name to a child according to his/her lunar horoscope; this is usually not the name by which he/she will be known. 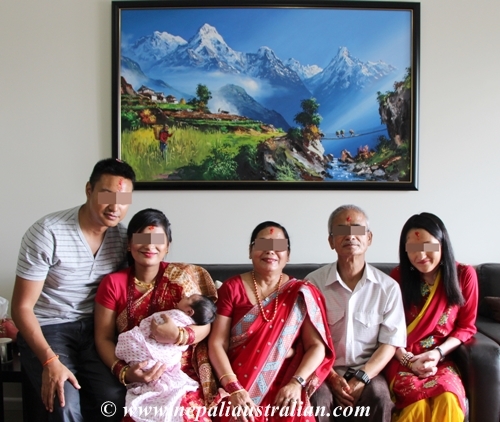 This ceremony is normally small and celebrated amongst close family. Typically, a priest is invited to perform the ceremony at home, and divines the child’s lunar horoscope from his birth details, as the mother is still recovering at home with the child. Until the mother and child are ‘purified’ (from past birth etc. in the religious sense), they should not visit the temple. For the occasion, I wore a red sari which was specially brought from Nepal by my mum for the occasion. It was a cotton sari which is what new mums are supposed to wear for the occasion. As soon as Chhori was born, we booked a priest for the ceremony and he gave us a list of things that are required for the day and everything was ready when he arrived at my place at 8.30 am on the day of the ceremony. 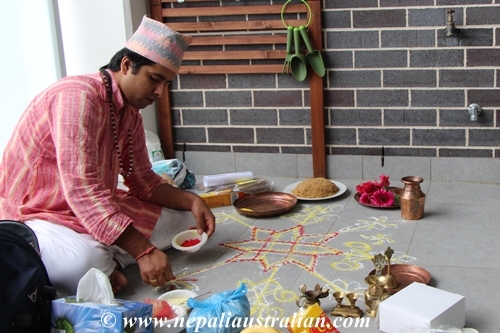 The main ceremony was conducted in the balcony of our apartment. Before the priest arrived we had cleaned and mopped the place. So, when he arrived, he started making a Mandap on the balcony. 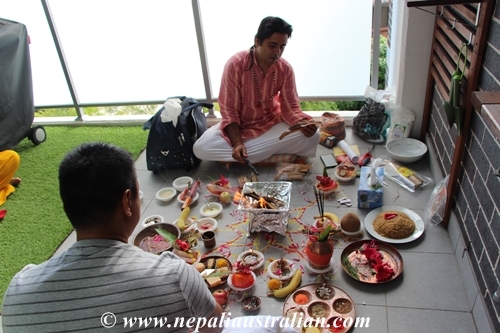 Once it was ready he asked AS to come and join him for the Puja. Then he asked me and Chhori to join the Puja. He chanted more mantras from the book. Then he asked me to perform Puja to the sun. Then he put tika on Chhori’s forehead and gave him a piece of paper which had details required to make her Jaata (lunar horoscope chart). Then my SIL took Chhori for Surya Darshan, i.e. to let the sunray fall on her as a blessing. Then the priest put Tika on AS, me and rest of the family. He also put Janai (holy string) around our wrists. After the ceremony, the priest left and the family function started. My parents, with the help of my brother and SIL, had prepared lots of trays of gifts for us and Chhori. 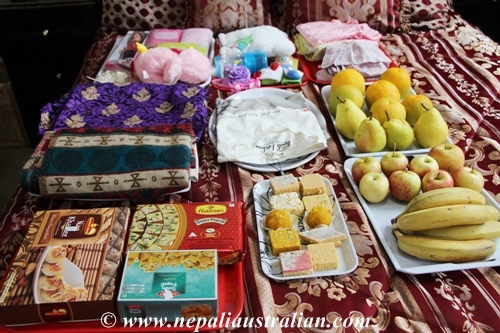 It included sari and other gifts for me, clothes for AS and lots of clothes, toys, and manchester for Chhori as well as trays of sweets and fruits. 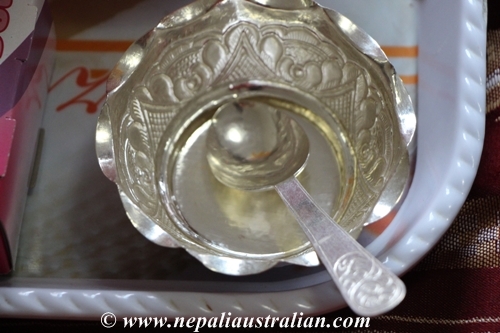 The special thing required was special sliver bowl and spoon which my mum has got from Nepal. My parents put tika for AS, me and Chhori and gave us blessing and gifts. It was really nice and special to have all my family here for the occasion. 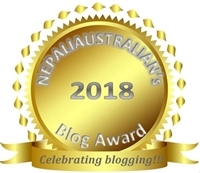 This entry was posted in Nepali Culture, Newari Culture, Our daughter, Personal and tagged Annaprashan, baptism ceremony, Chhaithi, chhori, dubo ko mala, golden threads, junko, Macha Junko, machabu-byakegu, motherhood, nepali kalli, Nwaran, Nwaran and Pasni, Nwaran ceremony, Pasni, silver anklets (kalli), silver ornaments, Thaa Bu, Weaning Ceremony. Bookmark the permalink. I love the idea of ceremonies to both celebrate and anchor milestones throughout life! I’ve often bemoaned not having these types of celebrations growing up within my cultural context. It seems like they or something similar got forgotten over the years. I’m excited to follow the ones we can from the Japanese side, especially those having to do with children. Congratulations and you have a lovely family. Your celebration of Nwaran seems so special and everything looks wonderful! Blessings to you and your family, especially the baby. A beautiful name for a beautiful baby. A huge congratulations to you! Beautiful photographs of this special time for your family and your little one!